March's peak in volumes is now ancient history as MOEX has seen consecutive monthly declines in FX volumes. Institutional trading venue Moscow Exchange (MOEX) has just reported its trading volumes for the month ending May 2016, which again set new lows in 2016 across its foreign exchange (FX) market turnover, registering yet another monthly decline and the lowest figure since November 2015, according to a MOEX statement. 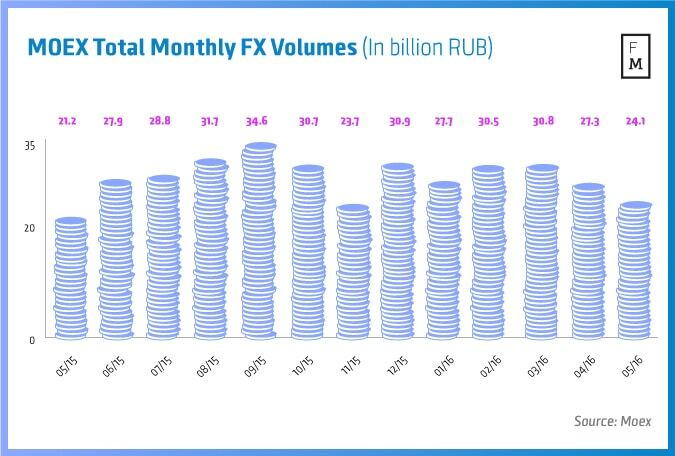 During May 2016, MOEX’s total FX market turnover retreated to RUB 24.1 trillion, falling another -11.7% MoM from RUB 27.3 trillion in April 2016 – the latest figures constitute back-to-back monthly double-digit declines in volumes at the exchange. In addition, May 2016’s turnover also included spot trades of RUB 6.7 trillion (RUB 9.9 trillion in April 2016) and swap trades of RUB 17.4 trillion (RUB 17.5 trillion in April 2016) in May 2016. The latest volumes at MOEX did notch a steady level of improvement against its May 2015 counterpart however, with the group’s FX market turnover securing a 13.7% YoY growth from RUB 21.2 trillion against May 2015. MOEX’s FX market’s average daily turnover in May 2016 was $19.3 billion (RUB 1,270.1 billion), which was good for an 8.1% growth YoY from $17.4 billion (RUB 1,175.5 billion) in May 2015. Finally, MOEX’s derivatives market volumes took a tumble in May 2016, yielding a figure of RUB 7.8 trillion for the month – this yielded a fall of -26.4% MoM from RUB 10.6 trillion in April 2016. The latest turnover across MOEX’s derivatives business was however markedly higher than May 2015, justifying a climb of 77.3% YoY vs. RUB 4.4 trillion in May 2015.